Recognizes a protein of 57kDa, identified as p57Kip2. It shows no cross-reaction with p27Kip1. p57Kip2 is a potent tight-binding inhibitor of several G1 cyclin complexes,, is a negative regulator of cell proliferation. Anti-p57 has been used as an aide in identification of complete hydatidiform mole (CHM) (no nuclear labeling of cytotrophoblasts, stromal cells) from partial hydatidiform mole (PHM) in which both cytotrophoblasts, stromal cells stain. The histological differentiation of complete mole, partial mole,, hydropic spontaneous abortion is problematic. Most complete hydatidiform moles are diploid, whereas most partial moles are triploid. Ploidy studies will identify partial moles, but will not differentiate complete moles from non-molar gestations. Complete moles carry a high risk of persistent disease, choriocarcinoma, while partial moles have a very low risk. 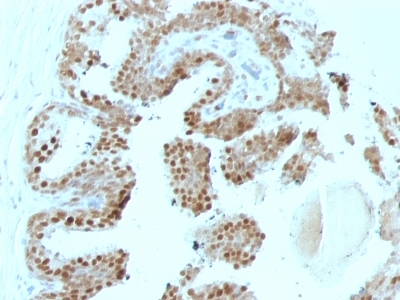 In normal placenta, many cytotrophoblast nuclei, stromal cells are labeled with this antibody. Similar findings apply to PHM, hydropic abortus tissues. Intervillous trophoblastic islands (IVTIs) demonstrate nuclear labeling in all three entities, serve as an internal control. 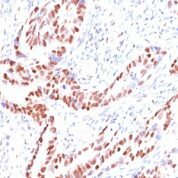 Anti-Human and Mouse p57Kip2 Positive Control Sample: LS174T, Raji, HT29, SK-BR3 cells. Colon or Prostate carcinomas. 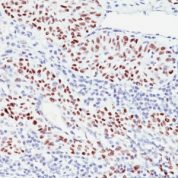 Anti-CDKN1C antibody staining is expected to be primarily localized to the cytosol, nuclear bodies and nucleoplasm. 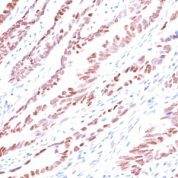 Variations in p57Kip2 antibody staining intensity in immunohistochemistry on tissue sections are present across different anatomical locations. An intense signal was observed in cells in the glomeruli in kidney, decidual cells in the placenta and trophoblastic cells in the placenta. More moderate antibody staining intensity was present in cells in the glomeruli in kidney, decidual cells in the placenta and trophoblastic cells in the placenta. Low, but measureable presence of p57Kip2 could be seen inglandular cells in the duodenum and small intestine and islets of Langerhans in pancreas. We were unable to detect p57Kip2 in other tissues. Disease states, inflammation, and other physiological changes can have a substantial impact on antibody staining patterns. These measurements were all taken in tissues deemed normal or from patients without known disease. 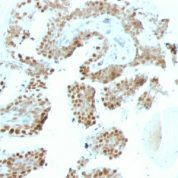 Tissues from cancer patients, for instance, have their own distinct pattern of p57Kip2 expression as measured by anti-p57Kip2 antibody immunohistochemical staining. The average level of expression by tumor is summarized in the table below. The variability row represents patient to patient variability in IHC staining. enQuire Bio's p57Kip2 Anti-Human, Mouse Monoclonal is available for Research Use Only. This antibody is guaranteed to work for a period of two years when properly stored.